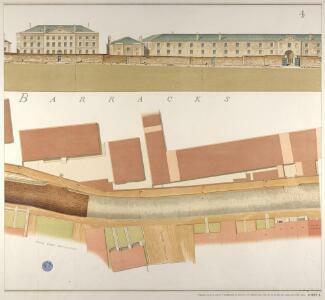 Description: The Horse Guard Barracks, depicted on the north side of Knightsbridge, were built shortly after the French Revolution at the end of the 18th century when the authorities feared insurrections at home. By the 1870s the barracks, considered too cramped and dilapidated, were pulled down and replaced by new buildings designed by Wyatt in 1880. The estate shown on Trevor Terrace, on the south side of the road, takes its name from Sir John Trevor, the Master of the Rolls and Speaker of the House of Commons, who built a house on this site in circa 1700. The estate illustrated here was built by his cousin, Arthur Trevor Hill, in the early 19th century.